Shane comes from a background in architecture and design, information technology, and content marketing, and practices UX research. Fundamentally, design thinking is applying the same process designers have used for decades to make everything from cars, appliances, and digital products to business strategy and other large system problems. The ideation phase of design thinking involves brainstorming using techniques such as Post-It notes for idea sharing. Empathize – Learn about your audience through research and interviews. Define – Construct a point of view based on user needs. Ideate – Brainstorm (Post-It notes on walls). Prototype – Build a representation of your ideas. Test – Test your ideas. It is expected that this inclusive, exploratory, iterative process will help designers arrive at decisions on what future customers truly want. An example is a request from a new client to redesign a bike part. Sales have slowed, and they believe that a new design will spark renewed interest and help fend off competitors. Absent of design thinking, we would dive in and create a new, slick design for this specific bike part. Employing the design thinking process, however, we would get dramatically different results. The five-step design thinking process reveals that the problem can’t be resolved with a newly designed bike part. The actual problem: A growing portion of the market feels intimidated by the complexity of newer bikes and longs for the simple, easy-to-use ones they grew up with. The answer: Create an entirely new category of bike that resonates with the unmet needs of the market for simple, back-to-basics biking. The value of design thinking lies in the identification of a larger problem which then leads to a solution around that theory. Over the past fifty years, design thinking has transformed into a way of approaching and solving large problems whereby, in order to develop a formal, meaningful, and emotional connection, the user becomes a kind of co-designer. 1969 – Herbert A. Simon and Robert McKim describe a type of rudimentary “design process” that can be applied to science and engineering. 1980 – Bryan Lawson addresses design in architecture. This would be the first time people are introduced to the idea of designers working with more humility in a participatory and democratic environment. 1982 – Nigel Cross introduces design thinking to a general education audience, resulting in a broader and widely accepted view of design thinking. 1991 – Design thinking is applied to business problems by David M. Kelly, founder of the design consultancy IDEO. The term becomes commercialized due to IDEO’s successful media coverage and high-profile case studies. Regrettably, design thinking has evolved from an industrial approach to something superficial. From 1991 on, the popularity of design thinking would also become its greatest weakness. Design thinking is about creating a thoughtful environment where divergent voices have a seat at the table. The process of building empathy, exploring problems, prototyping, and testing affords designers the ability to engage in intellectual investigations. Inclusive design. The design thinking process unleashes people’s creative energy through brainstorming sessions and group involvement. This approach is often described as a democratic process where the gap between “designers” and “users” is closed, helping to destroy top-down thinking and create diversified solutions. Problem synthesis. Design thinking employs a user-driven set of criteria that is approached with a blend of logical, linear thinking. In order to find the real problem, designers use these criteria to discover causality. Diverse voices. The ideation phase of design thinking invites people from various backgrounds and includes them in brainstorming sessions. This enhances the creative process by supporting a divergent set of ideas. Low-Risk. Design thinking is a low-risk process. The only thing invested is a set of ideas. Nothing has been built and no money has been spent developing solutions that require an outlay of cash and resources. A search online will reveal two divergent paths of design thinking. It won’t take long to realize that design thinking has become a victim of its own success. But why? 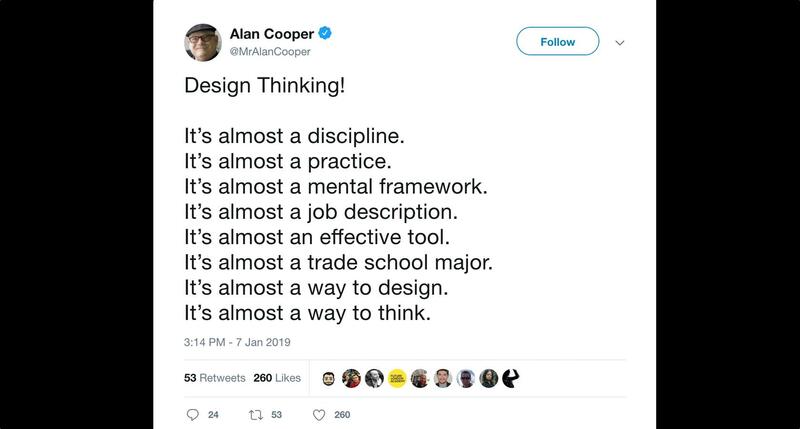 Alan Cooper shares his thoughts on design thinking on Twitter. In some respects, it becomes vogue or trendy to attack what is currently popular. A common argument against design thinking is that it dilutes design into a structured, linear, and clean process. 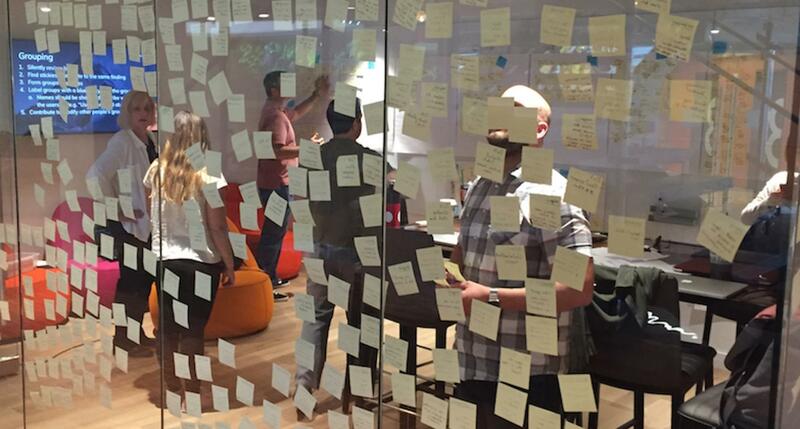 Critics argue that real design is messy, complex, and nonlinear, it isn’t derived from a stack of Post-It notes and a few brainstorming sessions. Natasha Jen, design partner at Pentagram, shared her criticism of design thinking in a now-infamous video that sparked heated debate and lengthy discussions within the design community. Design is human intuition. Does it really take an expensive and exhaustive design thinking process to understand that a medical treatment room for kids should have whimsical colors and a more delightful environment? She argues that spending money to arrive at this conclusion is nonsense. Lack of crit. Design thinking has become a bunch of buzzwords lacking criticism. “Crits,” or criticizing others’ work, is a messy process where designers surround themselves with evidence. This process helps designers evaluate whether something is good or not and it isn’t linear or reduced to a bunch of Post-It notes. She argues that without crit, design thinking is actually anti-intellectual. If we picture design thinking as a linear process void of messiness and mired in sequences, then it’s easy to see where Jen is coming from. True design is not linear and it is not clean. Out of the chaos comes the solution. Businesses love systems, frameworks, and buzzwords. In the 1980s, the US was introduced to Total Quality Management (TQM). The concept, based on the idea of continuous improvement, transformed the entire manufacturing core. TQM was everywhere. Classes sprouted up overnight. Management spent millions of dollars rolling it out. And if a company was not implementing TQM, then something must be wrong. TQM eventually fell victim to its own popularity. It soon became trendy to attack. Forbes posits that design thinking is on the same trajectory. Critics of design thinking believe that it has become yet another corporate box to check off. Once it becomes a: “Did you remember to check off that box?” mentality, it is no longer thought-provoking, nor does it stoke the fires of creativity. Businesses feel an urgency to find new ways to innovate, so they jump on the next popular framework and feel good about what they are doing. But are they actually doing any good? This dilution of design into a systemized process is worthy of the attacks. Designers know that it takes a thoughtful, complex, iterative, and messy process to arrive at a solution. We can’t learn this from a two-day workshop or a TED talk. Learning about empathy doesn’t mean we are empathetic all of a sudden. For the past fifty years, design thinking has been taking shape. Until the early 90s, when consulting firm IDEO began using it to solve large business problems, it was largely associated with science and engineering. In the corporate world, systemizing and frameworks are applauded so it was not long before design thinking became the newest trend. In some ways, design thinking has become a victim of its own popularity, as evidenced by increasing criticism from those in the design community. Whether warranted or seen as vogue to go against the grain, the fact that design thinking lacks many of the messy, non-linear elements of the classic design process distinguishes it and sets it apart. Design thinking helps solve business problems. It should not be thought of as a replacement for classic and more traditional forms of design, such as industrial, product or digital design. Design thinking is a type of design-related process, but not design in total. Design thinking is a human-centered approach to solving problems. It isn’t trying to replace the messy, non-linear, and critique-oriented design process. The term “design thinking” can be a misnomer because of the word “design.” It should be thought of as a business exercise which brings people together to help solve a problem. It has fallen victim to attacks because of its popularity and the desire to go against the grain. If used properly, design thinking is here to stay. It helps solve problems, brings divergent voices to the table, and carries a low risk. On the other hand, the classic design process is distinct from the design thinking process—it should remain so and continue to stand on its own. Design thinking offers several key benefits to businesses including collaboration, boosted morale, inclusivity, ideation, and testing methodologies that ensure better products and services. What are design thinking principles? There are eight key design thinking principles: empathize, define, ideate, prototype, test, and implement. The purpose behind design thinking is to help develop new, innovative solutions to problems using a human-centered process that includes idea generation and a highly collaborative approach. Is design thinking an iterative approach? Design thinking is an iterative approach. The process involves eight basic principles that work in a cyclical feedback loop until arriving at a set of optimal solutions to problems.